Most procurement people would describe their role in terms of getting the best prices, managing supplier risk ensuring certainty of supply. But it’s more than this. If you can get the best price but the logistics costs are extortionate then it’s not the best cost of supply. And if the process of purchasing or the payment terms are unusually complex or cumbersome, then it may be the wrong choice of supplier. Of course some of these purchase-to-pay costs are managed within finance but procurement need to take a holistic view and consider the total cost of ownership – the cost of acquisition, management of assets and ultimately disposal or contract exit. There’s a succinct, albeit somewhat simplistic definition of procurement. It’s all about managing the cost of doing business with your supply chain. It’s not just the cost of supplies. It’s all costs – and they are numerous. The cost of goods and services themselves, logistics costs, warehousing and supply chain management costs. There’s the cost of the purchase-to-pay processes, maintenance and support of purchasing systems and associated finance modules and accounts payable. But there’s a cost that most purchasing people overlook – the cost of working capital. 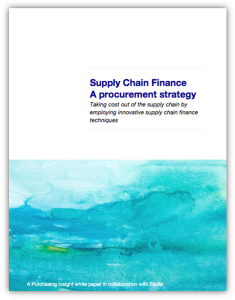 Overlooking the ways in which procurement can impact the cost of working capital allows significant costs to leak from the supply chain – a leakage, that if identified and stemmed, can have a major financial impact on both sides of the buyer/supplier divide.